• Rørtykkelse på bro: 50mm. Er varen på lager kan den ses i vores showroom. The Mobile DJ Truss Stand is a compact and lightweight solution to create a decorative stand for lighting. 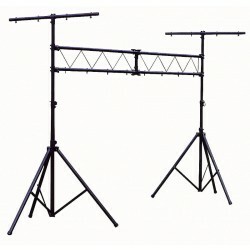 It's made of 50mm tube 290mm step truss parts which makes this stand heavy duty. The stand contains 8 parts and is quick and easy to build. With the optional flightcase (D7598) it is the ideal solution for mobile dj's and musicians.